the National Park Service proposed a total of 5.5 miles in a series of bridges plus the one-mile bridge project now underway. This new plan, backed by the Sierra Club and the 50-member Everglades Coalition, holds the greatest opportunity in decades to restore the River of Grass. a top priority. The National Park Service is expected to accept written comments on the final plan later this fall with a final Record of Decision slated for next spring. Then it will be up to the Administration and Congress to secure funding. Environmentalists hope to see seamless integration between the new project and the one-mile bridge now being constructed over the Trail. Building the 6.5 mile “Skyway” not only benefits the parched flora and fauna in the park; it is crucial to mitigating the impacts of sea level rise. The Everglades is sinking because dried-out soil is vanishing at an alarming rate. Scientists say a sinking Everglades and a rising sea means salt water could intrude into the Everglades and nearby drinking water aquifers within decades. Only by restoring freshwater flow across Tamiami Trail do we have a chance to rehydrate the soil and provide a head of flowing fresh water to counter the rising seas. Simply put, the sheer existence of the Everglades is at stake, and now is the time to act. We need your help! 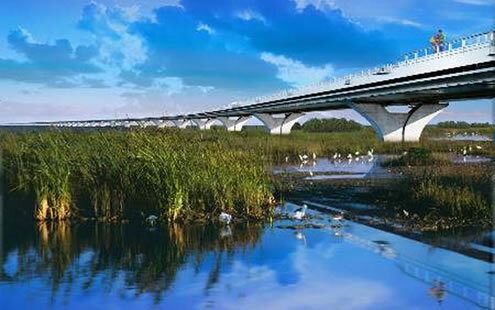 Sierra Club members can join the campaign by clicking “Like” on the Everglades Skyway Coalition Facebook page and learn more by visiting our Everglades Skyway website. To receive email updates, please send us an email with the word "Skyway" in the subject line.